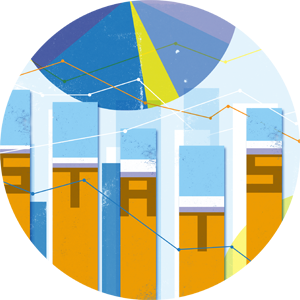 Founded in 1967, the Department of Statistics at the University of Kentucky is proud of its distinguished record of research, teaching, and service. Recognition of its faculty's contributions to the general enterprise of statistics, probability, and interdisciplinary research is evidenced not only by the publications and grant activity of its members but also by the numerous citations of its members' works. Indeed, the faculty have made fundamental contributions to the advancement of scientific knowledge, both in basic and applied statistics. The Department offers M.S. and Ph.D. degrees in statistics, as well as a graduate certificate and an undergraduate minor in statistics. The Master's program typically takes 2 years to complete and consists of courses in statistical inference, probability, linear models, design of experiments, and electives in a variety of topics. The Ph.D. program typically takes 5 years to complete, beginning with the 2 year master's program, followed by advanced courses in inference, probability, and applied topics. The culminating experience is the dissertation, which is completed under the supervision of a faculty member and a dissertation committee, and which makes a substantive contribution to the theory and/or practice of statistics. In addition to fulfilling academic requirements, students can participate in a number of organizations such as the Graduate Student Congress or the Statistics Students Association. Recently some students and alumni have been inducted into the inaugural cohort of Mu Sigma Rho for the Kentucky chapter of the American Statistical Association. Financial information for graduate students is available. Many advanced students participate in research across campus under the aegis of the Applied Statistics Laboratory or through other arrangements. The Department has awarded an average of 14 Master's and 3 Ph.D. degrees per year from 9/2010 to 8/2015. Alumni with Master's and Ph.D. degrees have had very successful careers in academia and industry. Several graduates hold faculty or post-doctoral positions at universities or hospitals including Cornell University, the Medical College of Wisconsin, Cincinnati Children’s Hospital, the University of Bristol, and Children’s Mercy Hospital. Others are employed by corporations such as Intel, Eliassen Group, Humana, Wells Fargo, Roche Professional Diagnostics, and Google. Anecdotal evidence from graduates indicates a high degree of satisfaction with their education and, while the credit for their successes goes to them, we feel that their years at the University of Kentucky helped launch their careers. The Department of Statistics has also contributed to the education of students across the University through its graduate and undergraduate service courses, its participation in the Mathematical Economics undergraduate major, and its minor in Statistics. For example, STA 210 helps students fulfill a UK Core requirement in an innovative flipped classroom environment which won its originator nomination for a prestigious award. Statistics offices are located on the third floor of the Multidisciplinary Science Building. Department computing is managed by the College of Arts and Sciences computing network. Every faculty member and graduate student has a dedicated Windows computer supplied with Microsoft Office and statistical software. A science library is available locally which contains books and journals in statistics and mathematics. The majority of these journal resources are also available electronically on department computers. Many of the department courses are taught using two dedicated computer labs in the Multidisciplinary Science Building.